She takes after her mother – they have the same green eyes and curly brown hair. John is such a funny person. He takes after his grandfather, who was a comedian. The technician is taking apart the TV so that he can fix it. The jeans I bought were too small, so I took them back and exchanged them for a larger size. I’m sorry I said you were stupid. I take it back. After the circus was over, the workers took down the big tents. My friend lost his job and his apartment, so I took him in for a month. The instructor spoke so fast that I couldn’t take in all the information. I love this dress, but it’s a little too loose. Could you take it in an inch? In the last few years, social media sites have taken off all over the world. He was at the party for about 15 minutes, and then he took off. The company has taken on three new staff members. In tonight’s boxing match, Antonio will take on an undefeated boxer from Argentina. I’m taking my girlfriend out to dinner on our anniversary. I took the letter out of the envelope. Germany took over several other countries during World War II. These books are taking up all the space in my room. Last month an urgent project took up all my spare time. I’ve recently taken up yoga. If you don’t like the way I do my job, take it up with my manager. If you want to be fluent in English, then you need to know phrasal verbs! However, most traditional English textbooks don’t focus on them. 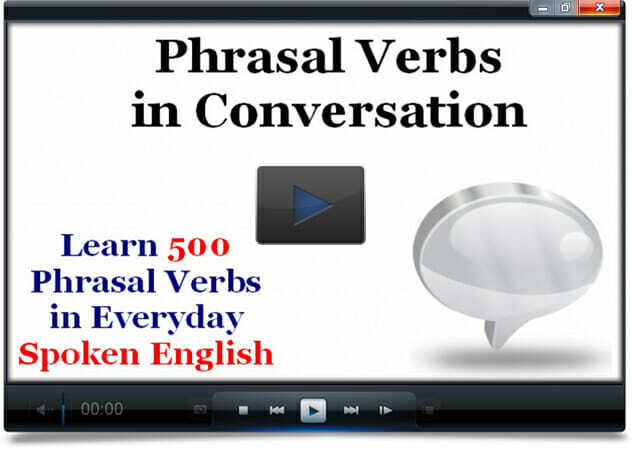 The Phrasal Verbs in Conversation Course will teach you 500 common phrasal verbs in the context of everyday dialogues. By listening to and reading the conversations, you’ll understand how each phrasal verb is used in spoken English – and there are plenty of quizzes and exercises for you to practice using the phrasal verbs in your own English.